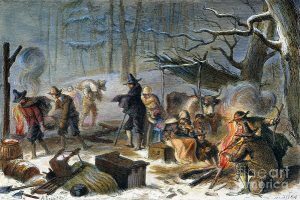 Give Thanks for PROPERTY RIGHTS | RANGEfire! When we celebrate Thanksgiving this week, I will give thanks for property rights. The Pilgrims at Plymouth didn’t share a feast with Indians after arriving in 1620 because America was so filled with bounty. It’s not that the Pilgrims were lazy or weak. They’d risked their lives to cross an ocean to try to build a community from scratch. But in tiny, often imperceptible ways, we each do a less efficient job, and pay less attention to the task at hand, if we think the whole community is responsible for that task. The Pilgrims were the same people after their switch from collective to individual farming—from socialism to capitalism, as it were—but after the switch, they thrived. That led to the first Thanksgiving in 1623. I worry that, 400 years later, we’ve turned into ingrates. Instead of celebrating individual producers, Americans give thanks to a gigantic government for handouts.